You get the picture. I also had no computer access for one full week of the past two while the office had all of it's furniture pulled into the center of the room. So all of that to say, I've been busy as all get out. I hope you have all been well and that you missed me. I missed you. And I did manage to sew in the midst of all that. 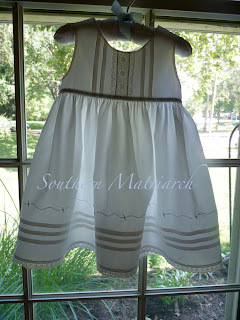 I finished the dress that Jeannie B taught at her retreat. Truth be told, there wasn't much to finish this dress. I had the construction of the dress 90% done before I left Louisiana. I just had to do the embroidery and buttonholes. As well as threading the floss through the edging at the hem. It really is a quick design and a treat to zip up. I love this little dress. It is made from a dress weight Swiss batiste. 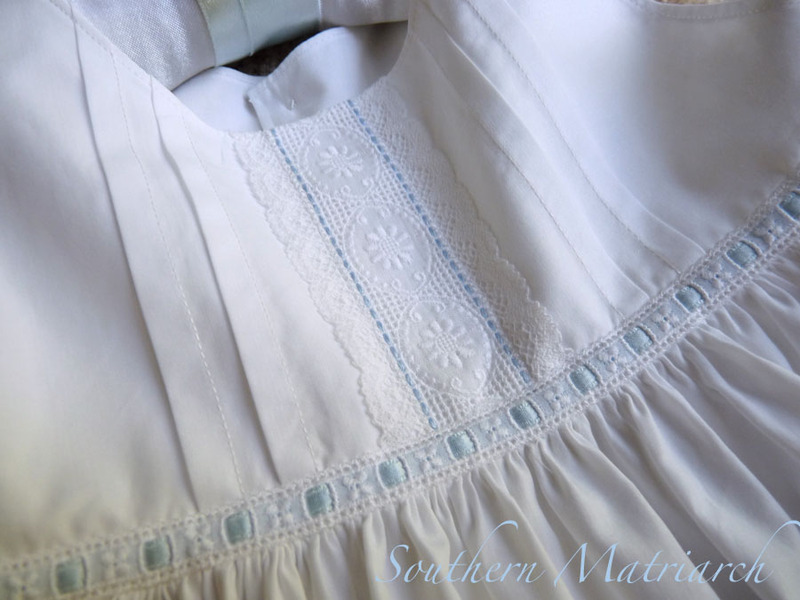 The bodice is tucked with a center of Swiss insertion and lace.The beading at the waist seam is the main technique learned at the retreat. 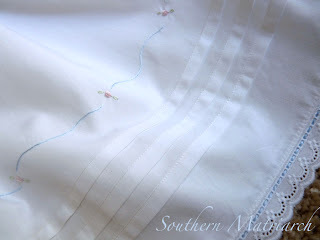 The hem is also tucked and edged with Swiss edging. 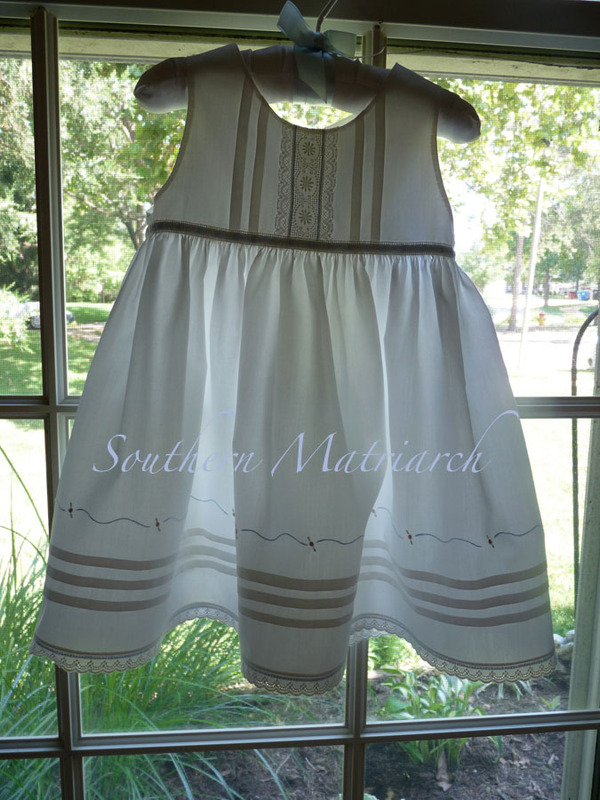 Simple embroidery embellishes the skirt above the hem. I used stem stitch for the blue and the flowers are bullion roses. Simpler than what was originally planned or even designed by Jeannie, but finished. There is something to be said for finished. It buttons down the back with MOP buttons. It is a darling dress, would be perfect for beach portraits. Perfect for a sweet barefooted baby on a hot summer day. The birthday dress is also finished but I don't have pictures of just the dress taken yet. I hope to do that tomorrow. As a parting shot, Princess right before her party. How quickly a year has gone by! That is an adorable dress!!! One of our little grands will be one this coming Sunday. It is so hard to believe that, like you said, a year has gone by!!!! 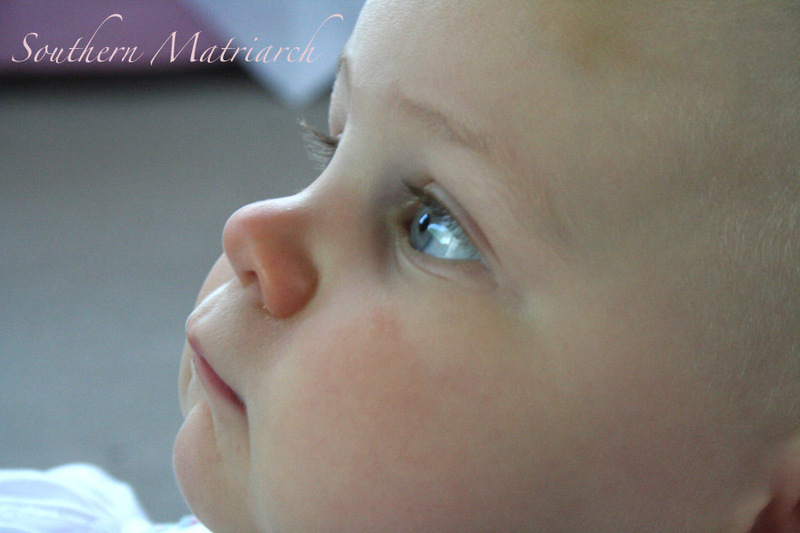 Your little one is so very pretty!!! 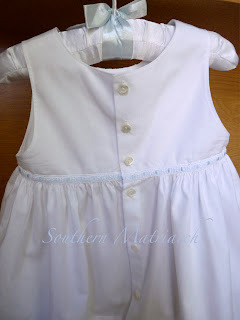 Precious dress for a precious child. Sounds if you are going to need a vacation after all that work. Congrats on getting the projects knocked off the to-do list. Beautiful dress! I can't believe she is a year old, what fun! I take it she was the one with the party of the century, right? 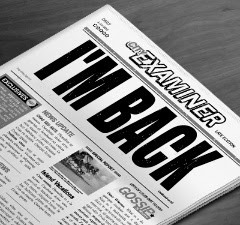 So glad you are back among the blogging! You were missed. Your dress is wonderful! I am still embroidering the hem on mine. Princess is precious, as always! Oh my you have been busy, we get new bedroom carpet next week and then I have to pick out new kitchen counters, been putting that off but it's time and then I need new living room/dining room carpet, it's never ending. Love the little slip dress !! 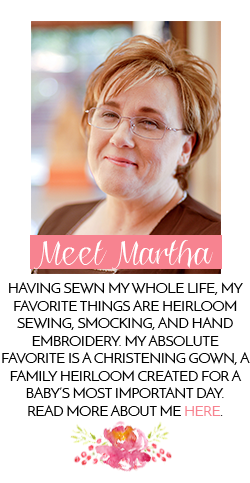 Such a sweet little face in that last pic and that pretty dress is too cute! I had missed you! Glad it was just busy-busy and nothing bad. The white dress is beautiful, and lucky you to have so many house-projects completed.